Frozen shoulder is a common condition where your shoulder becomes restricted and painful to move. It is also known as adhesive capsulitis. It is an inflammatory condition of the ball and socket joint where the capsule tightens and greatly restricts shoulder range of movement. Frozen shoulder can be easily confused with other painful shoulder conditions like rotator cuff injuries where movement is limited and painful. It is important to differentiate the two however, as the treatment may be different. To determine the cause of your shoulder problem, book and appointment now by calling 02 9144 1510 or by booking online here. The causes for a frozen shoulder are not clearly defined. It often happens spontaneously for no reason at all and occurs in people between the ages of 40-60, more so in women. Sometimes it can occur after a fracture, surgery or trauma. A frozen shoulder progresses through three stages, usually over one to two years. The initial “Freezing” stage is painful and range of movement starts to become restricted. It’s often painful at night and can stop you from getting a good sleep. In the second or “Frozen” stage your shoulder movement will be very restricted but pain should reduce. In the third and final “Thawing” stage your range of movement will gradually improve. People who have conditions such as diabetes and thyroid disorders are also more likely to get adhesive capsulitis. 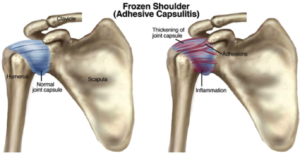 What Can Be Done To Treat Adhesive Capsulitis? Soft tissue release: To decrease spasm in the muscles surrounding the shoulder. Often to due the immobility of the shoulder the muscles and ligaments will have become shortened, and will need to be restored to their normal length to allow you to get normal movement back. Joint mobilisations: To increase range of movement and decrease pain in your shoulder. Other joints may also have become affected, e.g. the neck, due to compensations in your movement patterns when avoiding pain. You should ensure you seek an assessment as soon as possible. While frozen shoulder can take a while to resolve, we can assist you in developing strategies in dealing with the problem so as to avoid problems in other areas. You also need to exclude other shoulder pain causes which, left untreated, can become chronic and start to badly affect your quality of life. Be sure to book an appointment now by calling 02 9144 1510 or by booking online here.